With pollen season quickly approaching, we bet you’re wondering—what can you do to help put an end to watery eyes, scratchy throats, and stuffy noses this allergy season? Instead of popping anti-histamine after anti-histamine, consider an alternative, natural approach—chiropractic care! We’ll help your body better handle stress. It might not seem obvious to everyone, but the amount of stress your body is under can play a direct role in how allergens affect you. 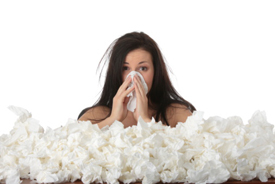 When you’re under a lot of stress, you’ll be more susceptible to allergic reactions. We’ll craft custom adjustments for you to help reduce the amount of stress you’re experiencing and make your body more adaptable to future stressors. Care with us can help boost your immune system. When your nervous system is functioning at its best, so are other systems in your body. Heightened immunity is excellent for fighting off allergens! You won’t find any negative drug side effects with chiropractic care. Certain allergy medications can cause a number of side effects that are far from fun. Unlike anti-histamines and pain relievers, chiropractic won’t make you tired, groggy or nauseous. If you’re looking for a drug-free option this allergy season, we can help! Ready to learn more? We’d love to invite you into our practice for an adjustment. Here, we’ll help educate you on more benefits of care and other things you can do to get through this allergy season without too many medications.